Here's the upper left corner. 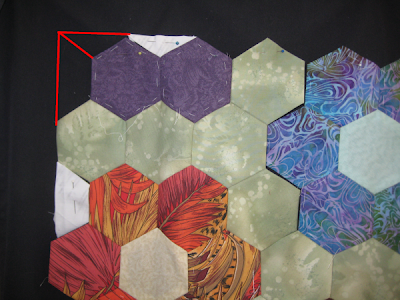 The blue arrow shows the one hexagon that has been stitched in place to become the side edge hexie. It fills in the "castle crenelation" space. 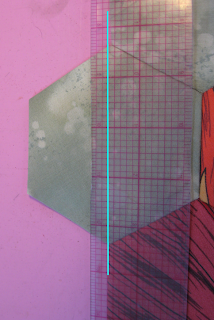 This picture shows a blue line on the ruler measuring a 3/8" seam allowance beyond the finished edge of the full hexies. I'll cut along the ruler edge, leaving the 3/8" extra to fold under. And this picture shows the sliced off "excess". I had a thought .... what if this sliced off "excess" could be used to fill in the zig-zag space at the top/bottom ? But alas ... it's the wrong shape and doesn't fill the space. So, the excess piece from the side hexies is just waste. It really is too small for me to do anything else with. Here's the finished edge of the sides of the top ... the half hexie fills in the "castle crenelation" space beautifully and creates a perfectly straight, finished edge. You can see in this picture both the front and back of this area. The basting thread you see on the back of the top *stays* on the hexie, holding the seam allowances in place. Because I don't stitch THROUGH the paper template, the basting thread doesn't show on the front and hence, doesn't *need* to be removed. I really dislike having more steps than is necessary when working on a project. If you need to do a step, that's fine ... but in this case, I read a blog (uncredited, I'm afraid) that showed the quilter taking a back-stitch at each folded corner *BUT* not going through the template, then dragging the thread to the next corner, etc until all the corners had been tacked together. 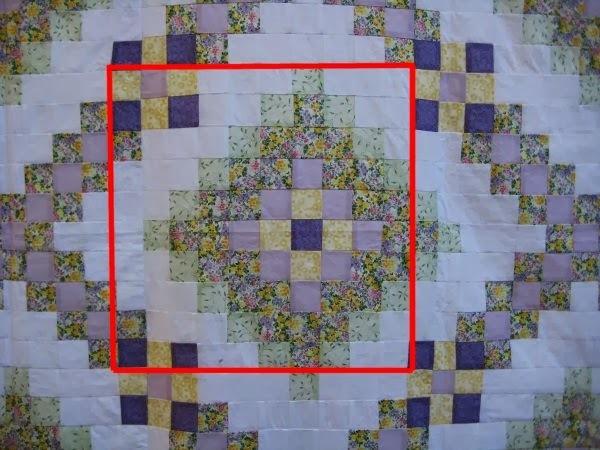 In this manner, all the corners are held down and the basting thread does NOT need to be removed when the hexies are stitched together! Although removing the basting thread is very easy ... it just pulls out ... it's one step that I don't have to do with all the many, many hexies that will be in this top. If I was using smaller hexies, there would be many more of them and removing the basting thread would that much more obnoxious. And finally ... here's a picture of the finished corner! I forgot to take progress pictures when I was doing the smaller partial hexies for the top, which fill in the zig-zag space, but it follows the same procedure as for the side hexies. 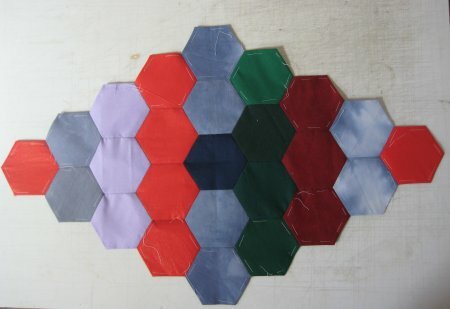 I was pleased to discover that my full-size hexie yields (2) of these smaller hexies, so there is much less waste. I'm also pleased that, eventually, I will have a nice finished, straight edge on the hexies so that I will be able to easily (and I'm all about being easy!! :-) ) sew on border strips. So, as I've been working on my hexi Forever Project ™, I've not only been pondering how in the heck I'm going to quilt this thing but thinking about the more immediate problem of how the edges are going to look like. Here's the upper left corner of my work-in-progress. There are two vertical columns here that haven't been sewn together. The top edge looks like a zig-zag. The side edges look like castle crenelations. Neither of which I'm thrilled about. Now, I realize these are these edges are the natural result of the hexagon shape, but those edges just don't do anything for me. One other piece of information: I'm a complete neophyte when it comes to hexies. I've been reading around the internet and taking in everyone's ideas and suggestions but eventually coming up with my own combination of techniques .... which admittedly probably isn't a new combination at all! That's one of the neat things about quilting: you can use whatever technique and method that suits you as long as it results in what pleases you. Now about those edges .... am I supposed to LEAVE them as-is? As in, that's the final edge of the quilt? Kinda like an angular scallop? Or, do I applique my finished hexie top to a border background so the final outer edge is nicely straight? 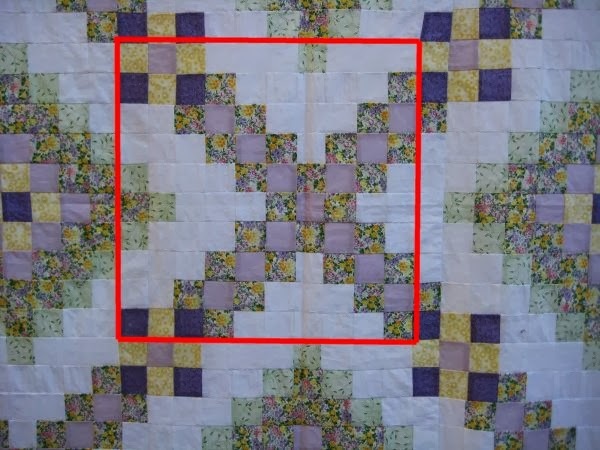 If I do applique the hexie edge to a border strip, will my applique stitches be STRONG enough to withstand the stress of use? So many things to worry about! And then .... ta da! I read Texas Freckles' 2010 blog entry on how SHE was thinking of finishing the edges of her hexie project. She proposes to simply *cut off* the extensions of the hexagons that are on the edge! What?!?!??! How radical! 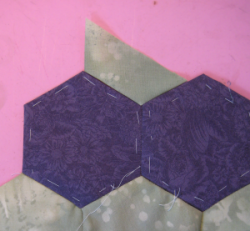 Since I am hand-piecing my hexagons, my first thought was 'oh no ... no way am I going to cut my hand-pieced seams in half! They'll come undone!' 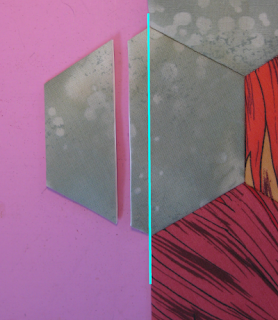 To avoid that, I made some paper templates that would effectively fill in those edge spaces and give me a folded edge to work with .... just like the full hexagons along the edges. I experimented with some scrap fabric just to see what it would be like and I must admit, I love the look and the idea! The drawback is that these are irregular shapes and folding the seam allowances to the back at the corners is tricky. But, it sure gives me the straight line with a folded edge that I wanted! This will allow me to whip-stitch a border strip onto the edge of the hexies just like I've been whip-stitching the hexies together. I feel much better and more confident about the strength of a whip-stitched seam than an appliqued "seam". In October of 2012, I started another hand-pieced top using ... oh my gosh ... MORE of the fabrics that had been used to make the Diggin's Quilt and 4-patch and Straight Furrows and Underground Railroad and a small Ohio Star quilt that went to the tornado victims of Moore, OK. I swear this fabric was multiplying on its own. I can't conceive that I ever bought that much. I like having hand work to do when I'm away from home. I call these projects my "Forever Projects" because I really don't have a deadline for them to be finished and I really don't care when then get done. I've had a number of Forever Projects since the first one in the 1990's. Well, I worked steadily on this project. Every Wednesday, I visit with my Dad and always take along a Forever Project. A lot of this project was sewn during those Wednesday visits. By Spring of 2013, it was done. My notes don't say how big it turned out to be but judging from the picture, I'd guess, off-hand, that maybe it was double? *maybe* a queen. I'm not really sure. In fact, the picture to the left isn't even of the *finished* top! I know there is another blue border around that outer border of diamonds. In any case, I eventually got the top finished. Now I was in a quandry. For whatever reason, I wanted this top to be hand-quilted. I had put a lot of time and effort into all the hand-piecing, although it obviously can't be seen. 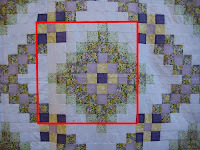 It seemed to me that hand-quilting would be the "proper" way to finish this quilt. Enter my quilting buddy, Donna. 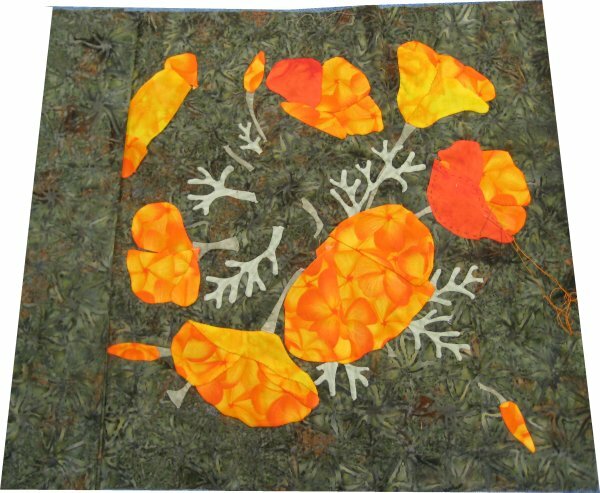 Donna hand-quilts. She pieces tops only under duress and then, only so she has something to hand-quilt. She'll even buy cheater panel prints, just to hand-quilt them. 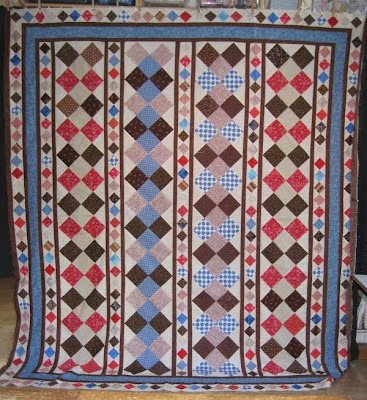 In the Spring of 2013, I asked Donna if she would be agreeable to a barter ... would she hand-quilt my top? 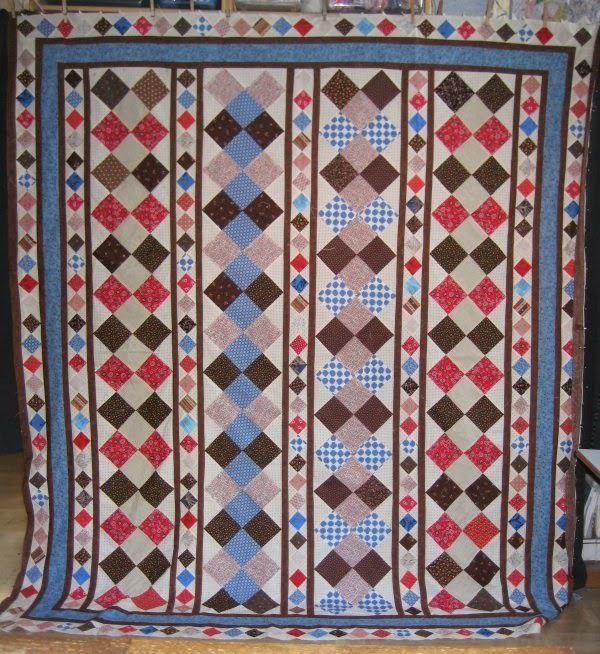 In return I would longarm quilt any quilt she has. She *was* agreeable except that she wanted me to finish piecing a Forever Project of her own ... something that had been languishing in her To Do pile since 2002 or 2003. I jumped on the opportunity! Without wanting to sound like a braggadocios, I feel confident in my own sewing ability to be able to sew almost any doggone quilt top you can throw at me. In March 2013, we exchanged projects. I handed over my Vertical Diamonds. We talked about what sort of hand-quilting would be done. I was of the opinion that ANYTHING she did would be a vast improvement of it laying about in my house. I was completely comfortable with whatever she felt comfortable doing. She stressed that she was not an expert hand-quilter; that her stitches weren't the same size top and bottom. I reminded her that the top wouldn't get quilted *at all* if I held on to it. She took notes on what we discussed and I gave her permission to change the quilting designs if she felt the urge to do so. Donna's project came from the book, "Trip to Ireland" by Elizabeth Hamby Carlson which combines Irish Chain blocks with Trip Around the World blocks in various fashions. Donna's choice was "Irish Trip". She gave me a GINORMOUS storage bag of yardage, strips, the book and a color key to relate her fabrics to the fabrics used in the pattern. 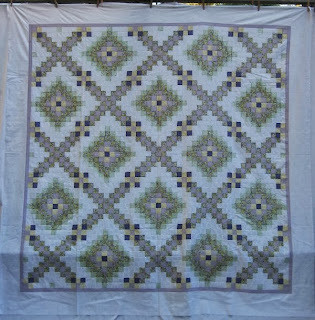 Because there was no time deadline for her to hand-quilt my Vertical Diamonds, she asked that I not start on Trip to Ireland "too soon" because she didn't want to be under "pressure" to finish the hand-quilting. So, I sat on it for a couple of months. Donna would sporadically send me photos of her progress-to-date. After the second one, I realized that even if she took YEARS to do the hand-quilting, if *I* waited until she was almost done, I might very well forget not only where I put her project but that I was supposed to do anything at all! So, in August 2013, without telling her that I was starting, I did. I cut hundreds of strips. I made tens of hundreds of strip sets. I sub-cut thousands of strips from the strip sets. I made tens of thousands of Irish Chain blocks (well, 13, if you want to be specific). I made tens of thousands of Trip Around the World blocks (well, 12, if you want to be specific). Each block is made up of 10 strips. Each strip has 10 squares, so that each block has 100 squares. 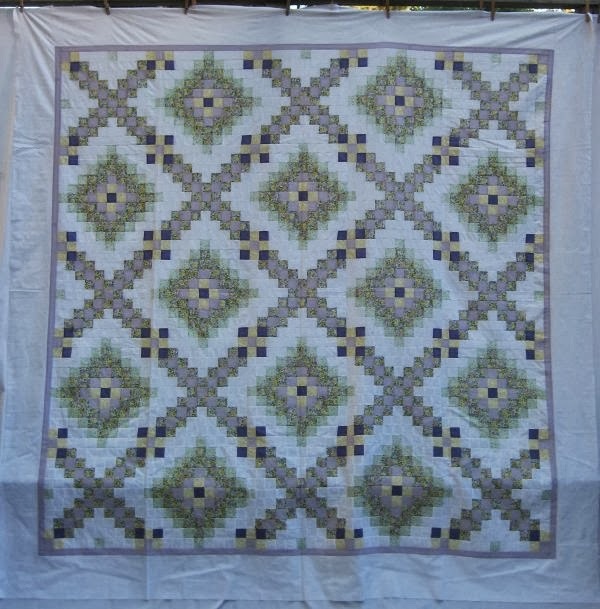 The entire Irish Chain and Trip around the World block portion of the quilt is made up of 25 blocks (5 rows of 5 blocks each) for a grand total of 2500 squares. Not every intersection meets *exactly* but, by golly, most of them do! 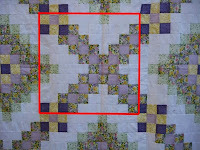 Two borders, one narrow, one wider, surround the pieced center. By September 2013, the top was completely finished. The measurements are approximately 88" x 88"; it's a good sized quilt top! Sit back because this is a LONG post! 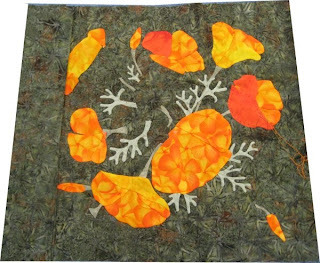 I have been working on an applique Forever Project for a while. It's one oversized block of California Poppies. I love poppies and so I snapped up this pattern since it also came kitted up. Well, I'm falling out of love with it. 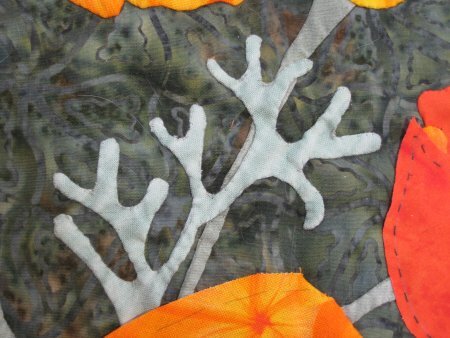 I'm pleased with the way the needleturn applique was done on the teeny-tiny leaves and stems. There were some VERY tiny curves involved and I believe I did a fairly decent job with them. Look at those tight curves!! 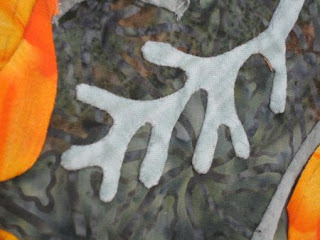 The ends of the leaves aren't supposed to be pointy, although I think that having pointy ends would have been easier to do than the rounded ends. Then I started the flowers. These flowers are supposed to look more-or-less realistic and have some depth to them. The fabrics you use provide this aspect and was one of the compelling reasons I bought the kit in the first place ... the critical orange-y fabric for the poppy flowers was already picked out for me. Granted, they were NOT the same fabrics as on the photo of the finished block, but they appeared to be close enough. But as I work on the petals of the flowers, I'm just not feeling the love. It's discouraging because the sample in the vendor's booth was simply wonderful. I'll finish the block, just so it doesn't remain a UFO, when in reality it shouldn't take me very long to finish it up ... if only I would focus on it. As a result, *this* project is coming along Very Slowly. While I was busy being discouraged by my California Poppy block, I decided to indulge myself and start another Forever Project. The rationale being that if I wasn't terribly interested in working on the California Poppies Forever Project, I would need something else to take its place. Enter the Fusion Forever Project. I read about this on a blog and it sounded SO intriguing! Another blog had more inspirational pictures. 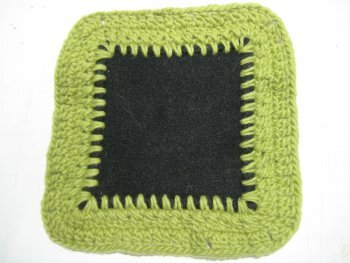 You sew a small-ish reversible block (two charm squares sewn right sides together, all the way around, leaving a small opening for turning) then *crochet* one or two rounds along the perimeter. That's the fusion part ... sewn fabric blocks and crochet. Well, I didn't want to do the sewing part because I have on hand a whole BUNCH of fleece leftovers. 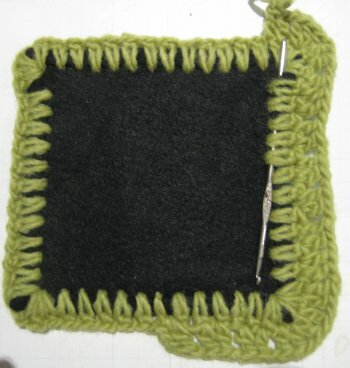 I thought that I could substitute a square of fleece and crochet around the perimeter of the fleece. My main reason for this particular Forever Project is because I was given a whole BUNCH of perfectly nice balls of yarn by a neighbor. I figured I could put that yarn to good use in this project. But, it kinda backfired on me. The yarn, while not bulky, isn't fine, either. 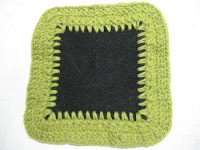 The fleece square, being only one layer, is very thin. The crocheted rounds for the border resulted in a very lopsided block ... it seems to me that the crocheted border rounds were really too heavy for the single layer of fleece. First I did two rounds, but I think that is *really* non-proportional. So, I started a block with just one round but I'm not thrilled with that look either. I even tried different types of borders ... within my limited crochet knowledge, of course ... but I was never quite happy with the unequal weights of the border vs the body of the block. I suppose I could use two squares of fleece, but then I'd need to align the holes along the edge of the fleece squares in order to crochet the foundation row. But mostly, I'm unhappy with the weight disparity. So this is another project that I've put in the "stalled" category. So, I'm STILL looking for a Forever Project to work on when I'm away from home. 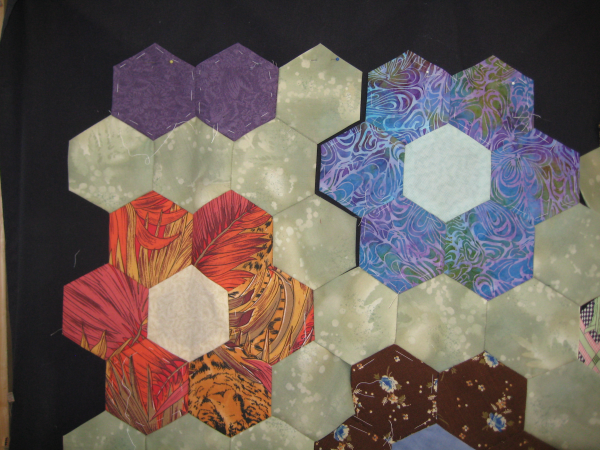 I've been seeing that hexagons are a Big Hit right now, so maybe I'll give that a whirl. Only ... I'm not going to be making those teeny-tiny hexagons. I want a project that has a reasonable possibility of being finished within my lifetime. I had previously purchased some time ago, a hexagon template that incorporated several different sizes. For no good reason at all and without anything for guidance, I chose to make a fairly large hexagon. Making a large size will give me more bang for my buck in terms of seeing rapid progress. I'm not sure what the proper protocol is for stating the dimensions of the hexagons ... some give the length of a side, others give the widest width. The size I chose was 3-1/2" along the widest width .. or .. 2-1/4" along the length of a side. This was the Forever Project that I brought along last month during our family vacation. 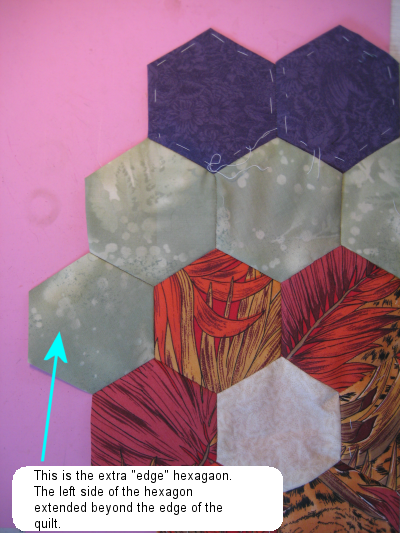 I brought along the foundation papers and precut widths of fabric to cut the hexagons from. All I did was make the individual hexagons and I managed to use up all my precut and prepped fabric. that the glue sticks quite nicely, thankyouverymuch. Then I realized that the hand-basting would work well all by itself. But I still would need to remove the hand-basting thread, since it was *through* the papers. THEN I read how to put a couple of back-stitches just in the corners and drag the thread from corner to corner ... the thread wouldn't even need to be removed! I'm all for not having mini-projects within a project! Once back home, I had to decide what to DO with the hexagons. All I could think of was the traditional Grandmother's Flower Garden, which does NOT float my boat. In thinking about *why* I don't care for Grandmother's Flower Garden, I have concluded that it's the double circle of hexagons that I don't particularly care for. Searching with Google/Images was enlightening ... there were a lot of projects that simply butted the hexagons up against each other, all willy-nilly .. no regard for color or design. It was just a scrappy top. And I didn't care for it. Not because it wasn't pretty! Oh my no .. they were gorgeous! It's just that *my* sense of creating random color arrangement is dismal and I knew that I really wouldn't care for my outcome. 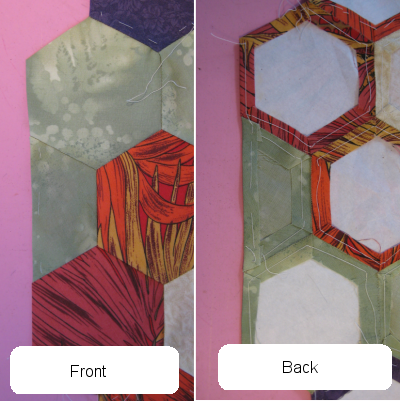 Then I saw some 'modern quilting' samples of using strips of hexagons as a design element on a base fabric. These were mostly solid colored hexagons. Well, as it so happened, I had a number of solid fabric hexagons that I had made. So, I assembled them into a strip. Eventually, it will be appliqued onto base fabric that will become (yet another) throw pillow. 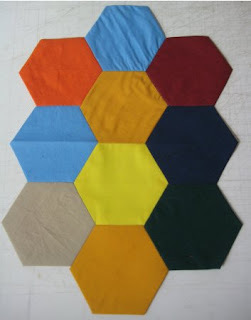 Other solid fabric hexagons were assembled into a lozenge-shape that I *think* I will back with felt and make into a table runner for my dining room table. Unfortunately, because I didn't think ahead or plan colors (because I didn't know I was going to be making a table runner), the colors in the potential table runner have absolutely nothing in common with my dining room. ::sigh:: But, I may do it anyway. 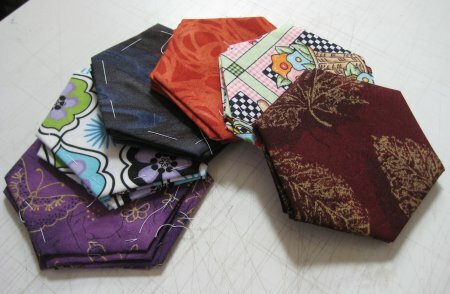 I may also make some placemats with hexagons in a strip down one side .. mainly to coordinate with the table runner. Maybe. Ah! Here was an arrangement of hexagon flowers that didn't look like Grandmother's Flower Garden and one that appealed to me. I liked the staggered arrangement of the flowers rather than all the hexagon flowers being arranged in a tic-tac-toe grid. I had a LARGE amount of medium green Fossil Fern yardage that I had purchased for a different project that never panned out. It was this Fossil Fern that is being used as the background/filler hexagons. 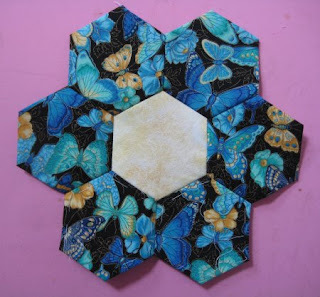 So, this Hexagon Flower Forever Project is the one that I'm currently using as my portable project away from home and also when watching a TV show with Mr. Pirate when I don't want the sound of the sewing machine intruding on the show. It's rather satisfying to sew together the hexagons into flower units then make the background/filler units and sew them both together. As I complete each flower unit, I'm assembling them into columns on my design wall. 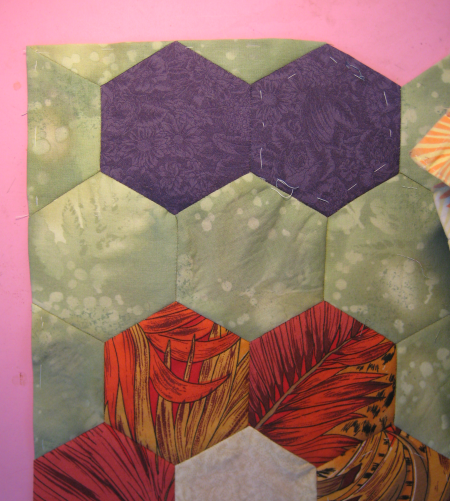 One advantage of this large size hexagons is that the top is going to go together quickly. I'm not sure, at this point, what size the top is going to be. Using approximate measurements, I figure a twin will take 6x8 units, a double will take 7x8 units, a queen will take 8x9 units and a king will take 9x9 units. In the photo on the right, the leftmost column has 4 flower units in it (the 5 green hexagons on top of the flower hexagon is one unit). The last flower hexagon in the right column doesn't have its green hexagons yet.